The holidays are finally at an end. We went through Gabriola pass on Monday afternoon and ducked into Silva Bay with the intention of heading across the Strait Tuesday morning. 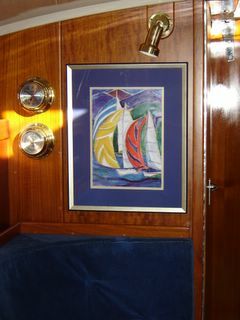 Another sleepless night at anchor with gusts of over 20 blowing through and a small craft warning in the Strait. 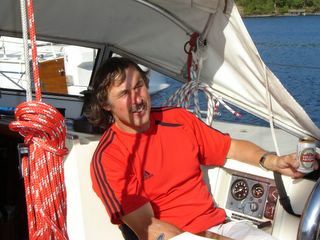 At about 5pm Tuesday we hauled the anchor, admitted the holidays must end sometime, doned our long sleeves for the first time in two weeks and headed across the Strait. 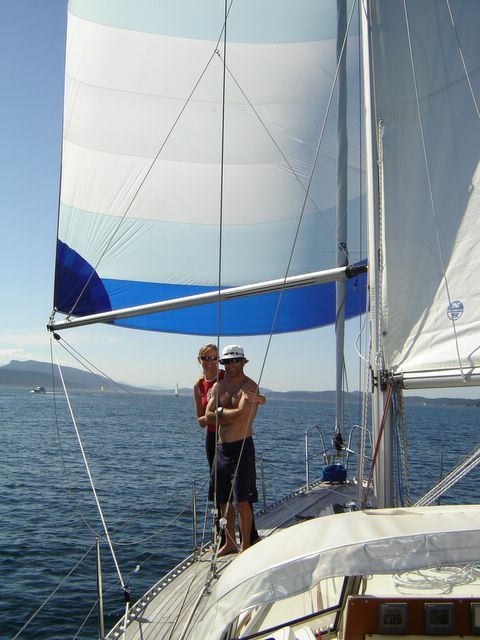 This was one of the best sails of the trip with the wind and tide going with us all the way into the Bay we were reaching until the Point Grey bellbuoy where we hoisted the cruising chute and headed down into English Bay. 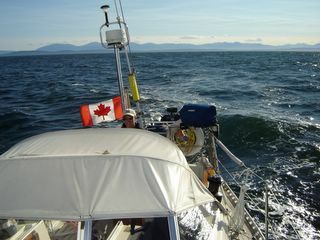 A lovely breeze carried us all the way to the Kits barge buoy where we doused the chute and made for home. 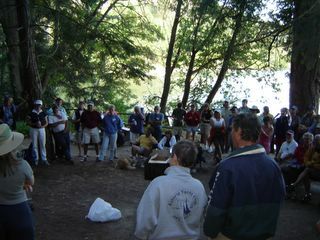 The crowd of Bluewater members at the August long weekend farewell to the fleet rendevous in Montague Harbour. We sailed all the way into the anchorage with the cruising chute up and a good little breeze. It blew up that night in the crowded harbour so it was a bit of a sleepless evening. 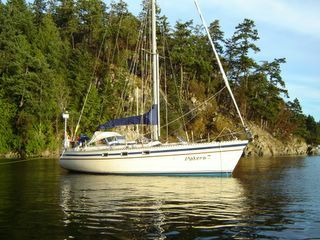 Here we are anchored in Bedwell. 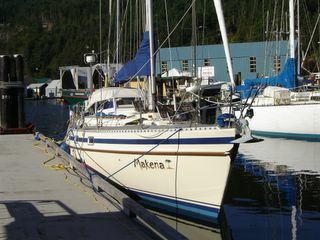 The anchorage was packed since it was the August long weekend. We ran into Richard on his C&C, Mystic. After a bbq dinner on the boat we took the dinghy into the pub and met up with Richard and his friend to have a few drinks and take in the local band. 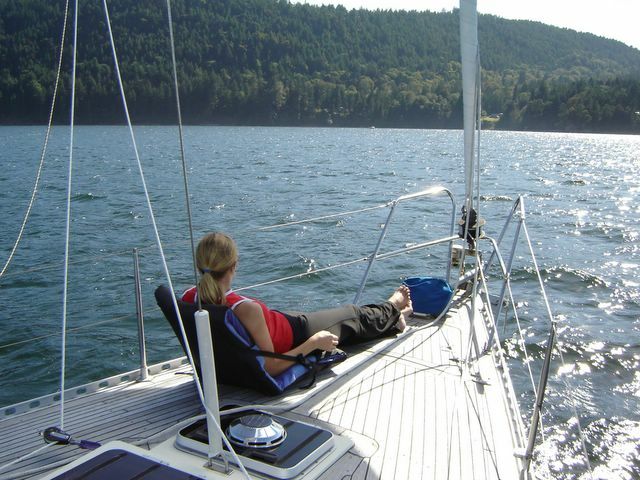 From Sidney we sailed to Bedwell Harbour on South Pender Island. We wanted to check out the new Poets Cove Resort. 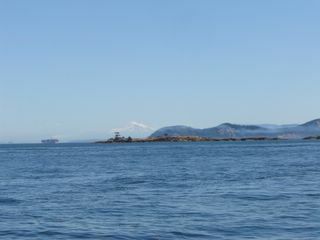 You can just see the mist rising in this picture and Mount Baker in the background. 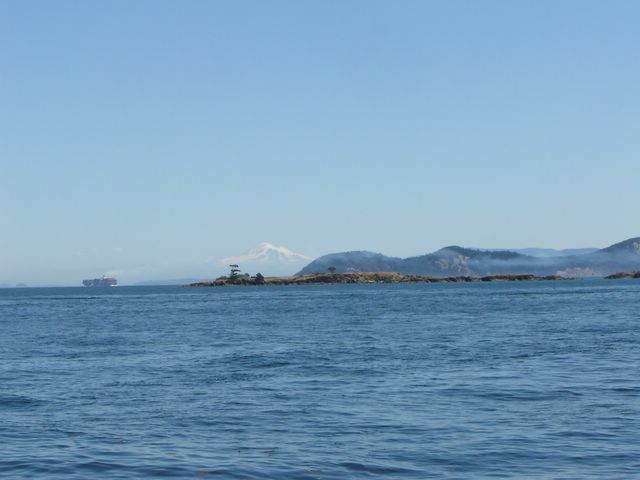 Another beautiful sunny day in the Gulf Islands! 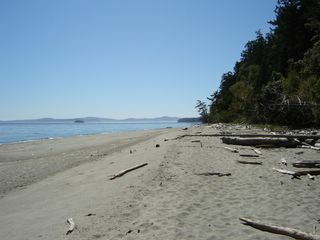 There are about 5k of walking trails at Sidney Spit as well as a picnic and camping area. 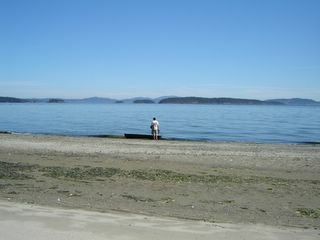 Steve found an old rowboat awash at Sidney Spit. The sand felt wonderful on our feet. It was almost like being in Hawaii. From Genoa Bay we headed down into Tod Inlet and from there we sailed around to Sidney Spit. 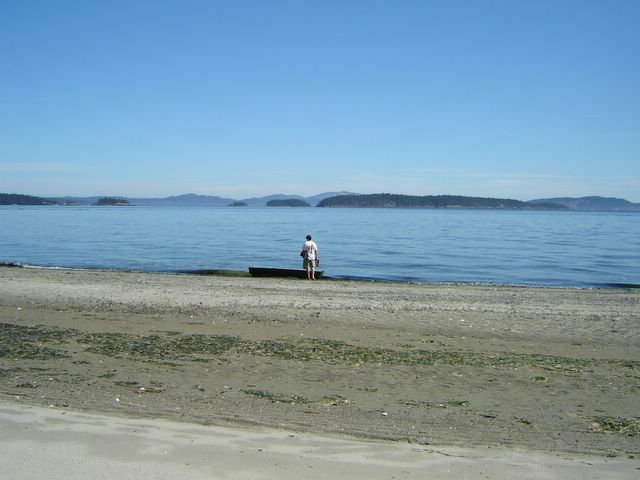 It was our first time at Sidney Spit and we would love to go back. It's a large marine park with miles of sandy beaches and walking trails too. 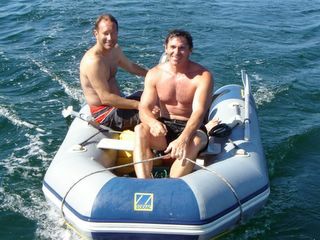 We managed to pick up a mooring buoy and then we decided to make the 2 mile trip in our little dinghy to the town of Sidney. Not the best idea but we made it there and back, a tank of gas each way! 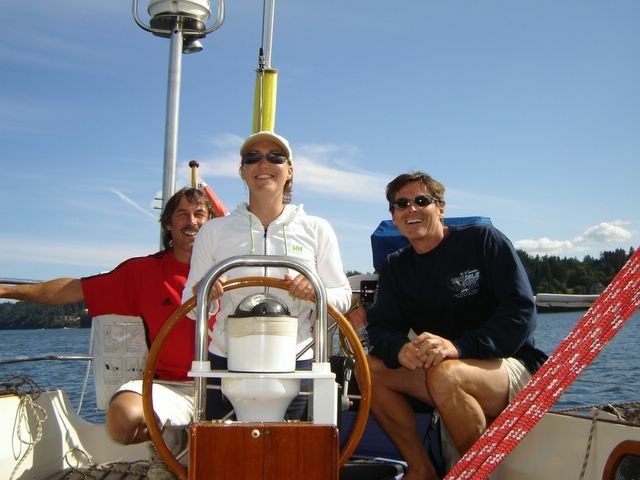 The three of us (Steve, Deb and George) sailing under spinnaker all the way into Genoa Bay. 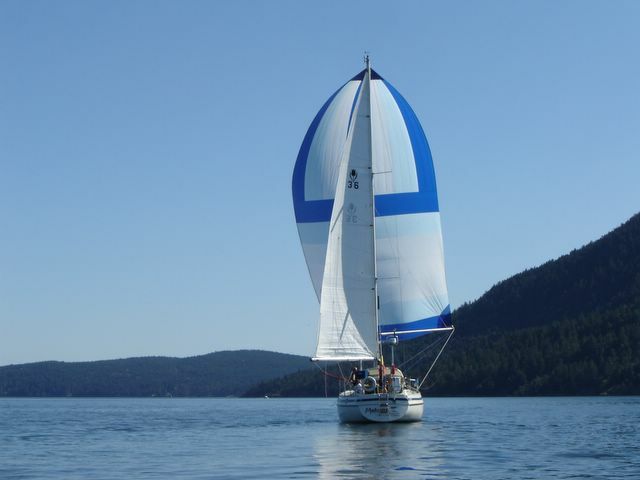 We managed to convince George to come out for a sail from Maple Bay to Genoa Bay. From Saltspring we had a long motor out of Ganges Harbour directly into an 18knot breeze. 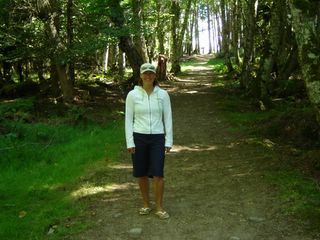 Once we rounded the corner at Beaver Point the wind died off (go figure). We continued to motor while Steve was below fiddling with the Nav stuff. 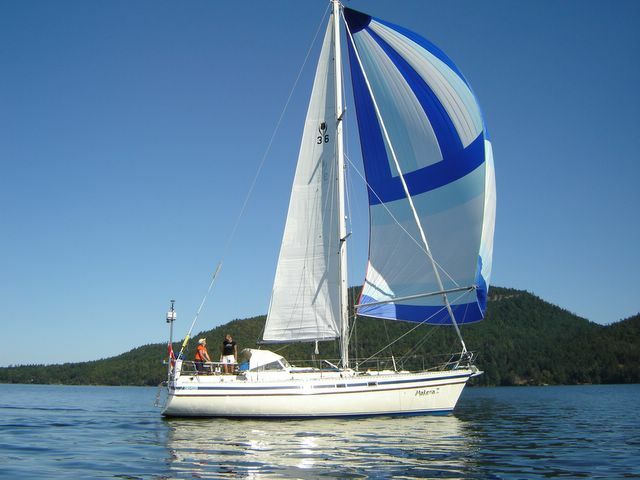 I saw 4 knots of wind register and decided that was enough for me so I hoisted the main, unfurled the jenny, struck the engine and away we went. We were making our way towards Maple Bay to visit Steve's good friend George. Soon enough the wind was at our backs so we hoisted the cruising chute and as we approached Cow Bay the wind picked up for an exciting sail and a couple of hairy gybes. The picture above is Makena tied to the dock in Maple Bay. Sadly Mark and Camille had to go back to work so we parted ways at Saltspring. Steve and I decided to stay on another day and while wandering through one of the many galleries on Saltspring we came across this print. The perfect addition to our home don't you think? Mark and Steve arrive safely back to the boat nicely refreshed after an afternoon swim. Hey fellas you'd better hope the wind doesn't pick up too much or you won't make it back to the boat with that little 2.5 horse on the dinghy! Since Mark and Steve "jumped ship" someone had to sail the boat. Camille and I get into trim goddess mode and show those boys how it's done. Was it something we said? 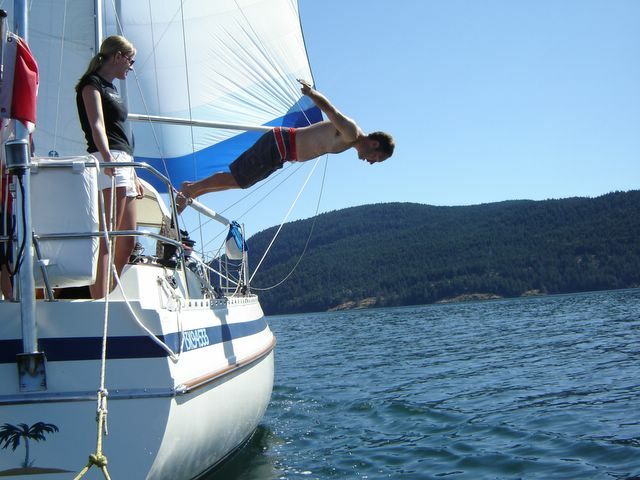 Mark decides to jump ship (he was showing off for the ladies). Mark and Camille prepping the "gourmet" crab bait (a little canned chicken wrapped in cheese cloth and tied with dental floss). Hey, don't laugh - it worked! Summer vacation July 24th - August 2nd, 2005. Our friends Mark and Camille joined us for the first part of our vacation. We left Vancouver intending to head across the Strait to New Castle Island near Nanaimo, however in a brisk breeze and lumpy sea we thought it would be better to crack off a bit and head through Porlier Pass. First anchorage was made on the backside of Pirates Cove.